Bright new color! 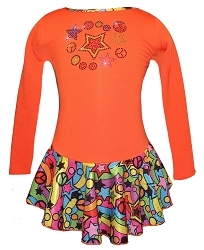 Stay warm and look great in bright orange Polartec power stretch ice skating jacket with crystals "Biellmann" applique: 450pcs. superior machine cut czechoslovakian rhinestone. Great for every day practice and competition event. Fitted style without a hood and high performance polartec fabric ideal for ice skating, that demand freedom of movement, moisture management, and warmth. Enjoy skating and look great on the ice with premium ice skating jacket by Ice Fire - your way to shine!